HTC One A9 aka HTC Aero has been showcased in a leaked image sporting different colour variants. The image posted on Twitter also gives more idea about the smartphone’s design. 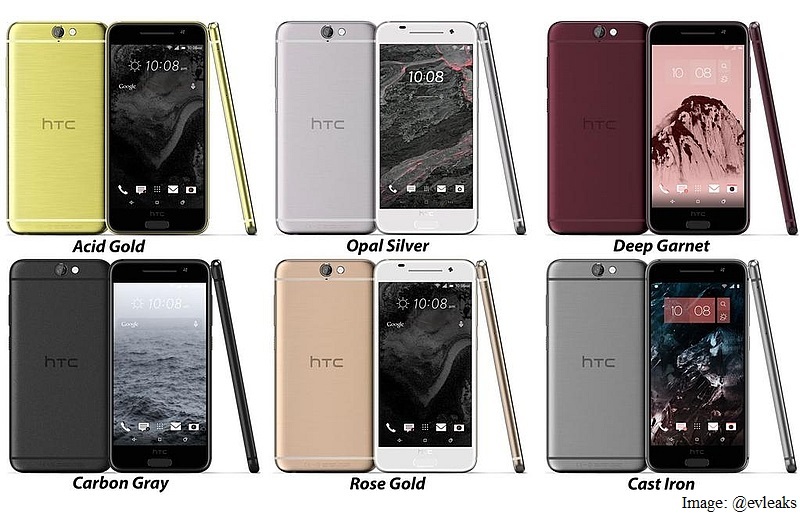 As per the image shared by @evleaks, the HTC One A9 is seen in six colour variants namely Acid Gold, Opal Silver, Deep Garnet, Carbon Gray, Cast Iron, and Rose Gold, same colour variant introduced by Apple this year for its iPhone 6s and iPhone 6s Plus models. The image suggests the unannounced smartphone to sport an iPhone-like design with bold curved edges and two wireless antennas running on top and bottom. The front panel can also be seen with a physical button at the bottom that might double up as a fingerprint sensor as well. As per the same source, the HTC Aero A9 is supposed to pack a 5-inch full-HD (1080×1920) resolution Amoled display, 2GB of RAM, 16GB of inbuilt storage, which can be expanded via a microSD card, 13-megapixel rear camera, 4-UltraPixel front-facing camera with OIS and BSI sensors, and a 2150mAh battery. It is said to sport a metal build and 7mm thickness. HTC earlier this month posted a press invitation on its Weibo page that talked about a press event in Hankone, Japan on September 29. As per the invitation, HTC might launch “dual flagship” devices. The two flagship smartphones are not shown in the invite. However, the recent leaks do point to two possible launches: the HTC Aero aka One A9 and the HTC Butterfly 3.